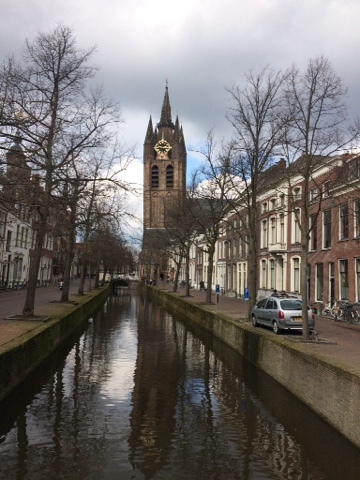 Day one of my ultimate spring trip to the Netherlands began in Delft, a charmingly beautiful town made famous more recently by the book and film, Girl with the Pearl Earring, a Johannes Vermeer painting that now graces this lovely medieval town EVERYWHERE and in every imaginable form. 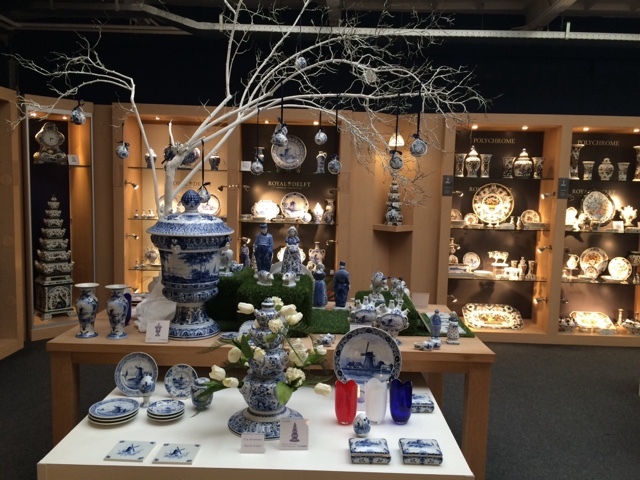 Along with being the place where Vermeer was born and raised, Delft is also home to the famous blue and white porcelain that many associate with the Netherlands. Since my color palette is rooted in blue and white, I just needed to see this town! It did not disappoint even though we had some heavy rain early on. Fortunately for us the sun emerged later in the day and created some lighting effects that Vermeer would've loved. 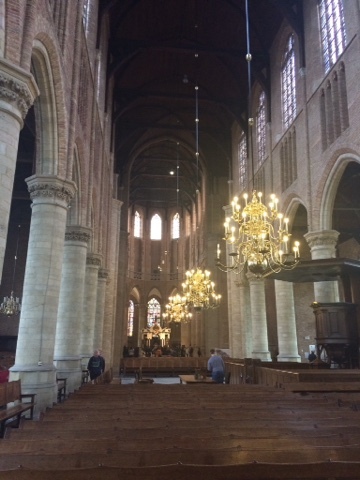 The town is dominated by two churches, the old church, built in the 15th century and the new church, built in the 18th century! 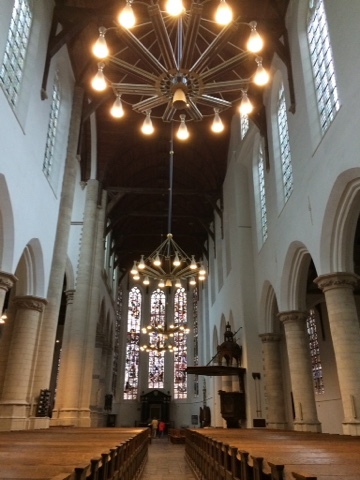 The old church interior. I love how in Europe an 18th century church is named the new church! Both are modest but beautiful sanctuaries worth wandering through. 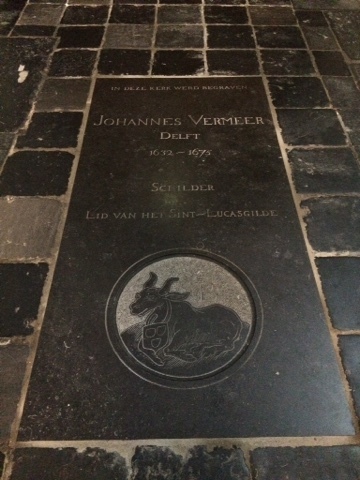 The old church boasts the grave of Vermeer. 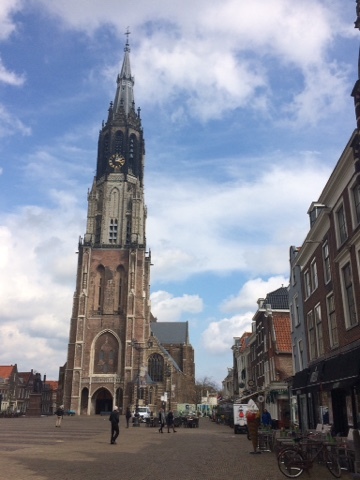 I should also mention that Delft is where all royalty are buried, a tradition that was started with William of Orange. 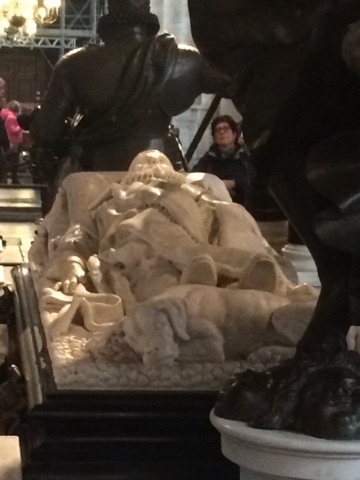 The best part of William of Orange's grave was, of course, the doggy, sitting at his feet. In my mind, it made him an honored gentleman! 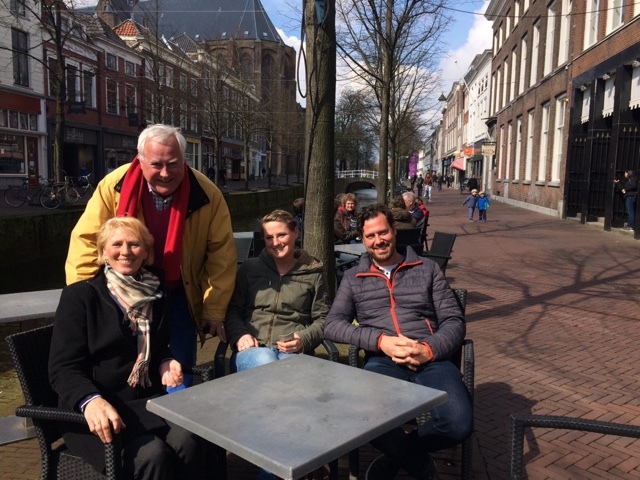 My dear friends who now live in Alphen aan den Rijn and their youngest daughter and her husband accompanied me on this wonderful day. They had fun being tourists in their own country and many of the things we did were new to them! 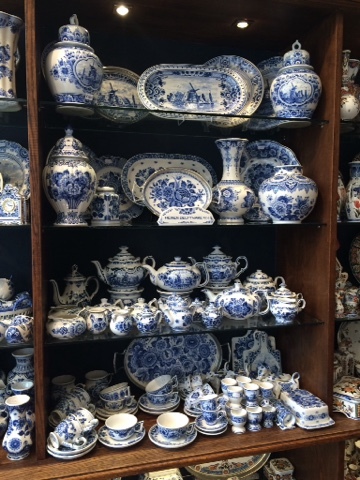 None had been to the Vermeer Center in Delft so we all learned something by enjoying the tour. My favorite, the artist painting the artist. 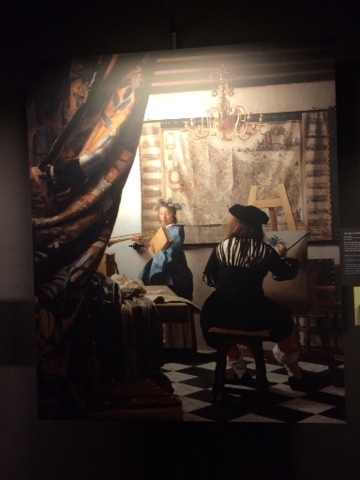 None of Vermeer's originals are here but a reproduction of every painting he did is on display in chronological order along with an audio guide that gives you a real feel for what Vermeer was trying to do with his work. He is known for his techniques in painting light and all in all, I really loved the whole tour. Many of his subjects look toward the viewer which I found quite interesting and there are small details in each painting that are easily missed without some knowledgable commentary. 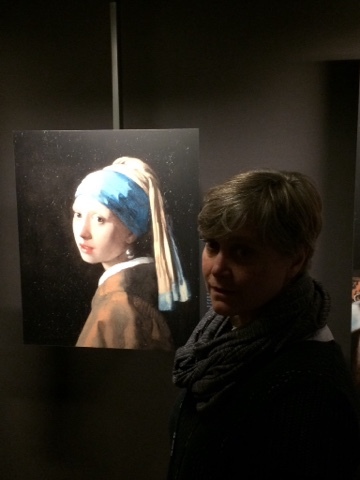 I will now look for Vermeer's when in an art museum. His body of work is not very big so it's a real treat to get to see one first hand. The exterior of the new church. 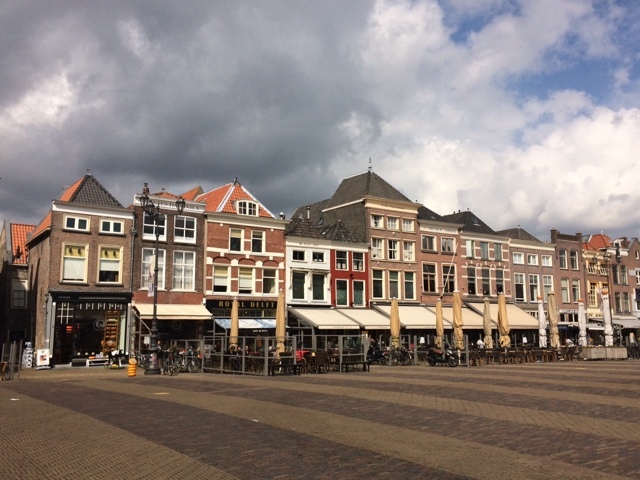 We enjoyed a delightful lunch, tried some beer from the region, wandered through some shops and enjoyed taking in the buildings and canal views. 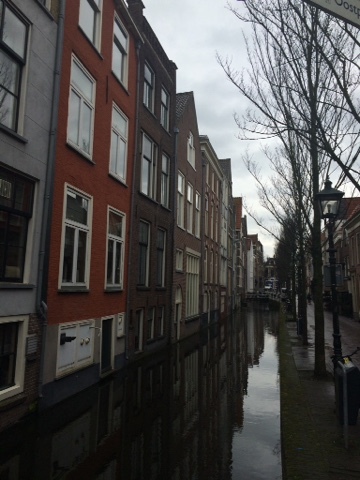 The doors and steps of these canal houses are so close to the water! 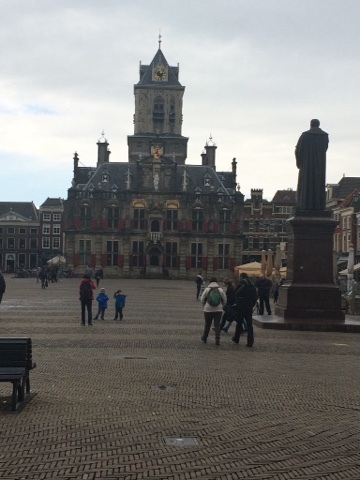 City hall on the opposite side of the square from the Old Church. The old church really leans and from this angle you could definitely see that it is not an upright building! 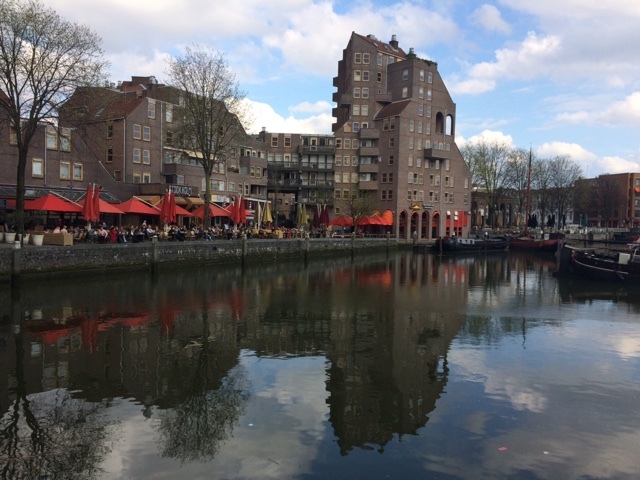 Before leaving we sat canal side in the sunshine and enjoyed a coffee. European afternoon break at its finest! After leaving the old center, we drove about a mile to the porcelain factory. 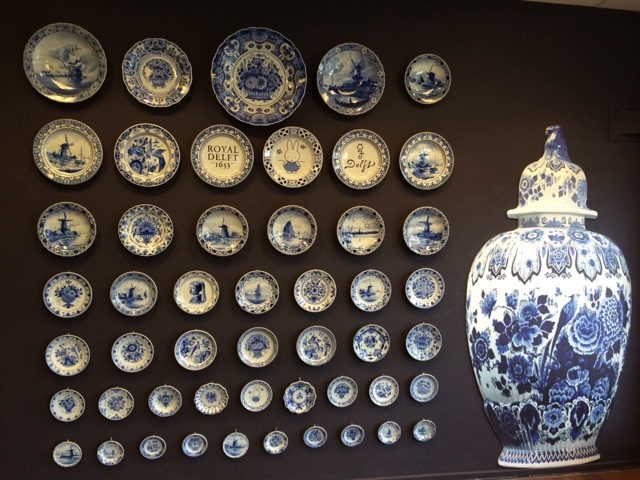 We skipped the tour as I had been on tours of porcelain factories before, but we did wander through the shops and admire the handiwork. I bought a vase that will look great in our house and I will enjoy putting tulips in it whenever I can as a wonderful reminder of this lovely trip. The displays in the shop were quite impressive and if one had loads of cash, there were several appealing objects to dazzle the eye. 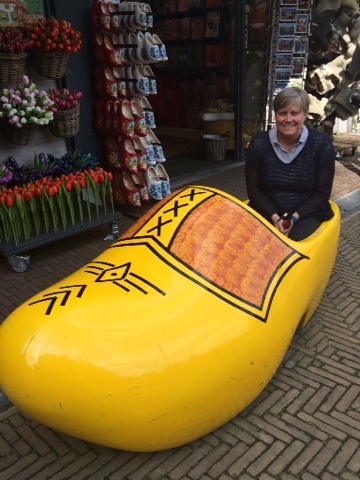 My friends had lived in Rotterdam prior to moving to Stockholm so that was our next stop. 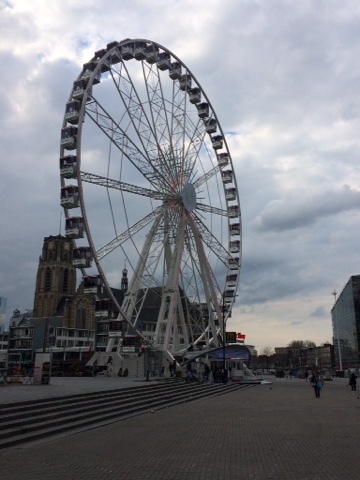 Rotterdam was bombed in WWII and so is a city that has been rebuilt. 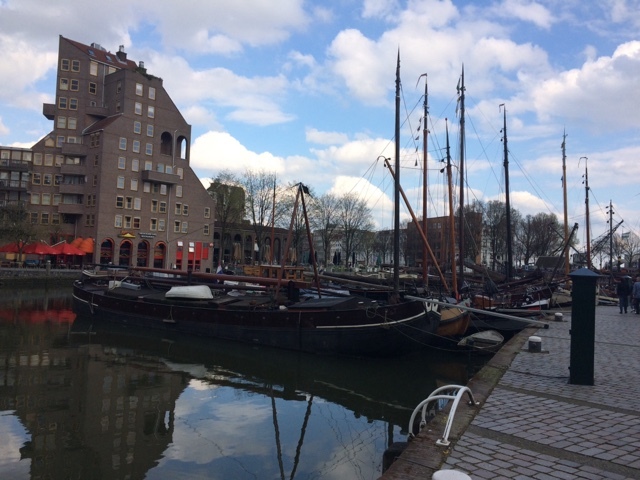 Today it is a modern port city with lots of industry and cool architecture. 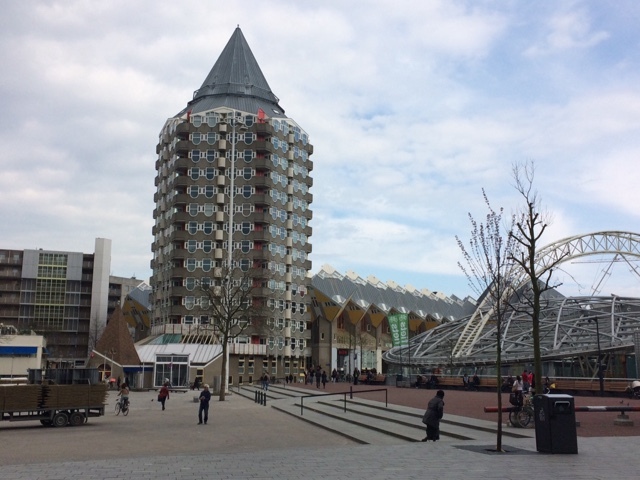 A new marketplace has popped up in the middle of town and it is a very interesting design. The inside boasts a beautiful open market with food from all over the world. I enjoyed several samples that were on offer. The sun was really shining in the afternoon so we wandered down to the water to a placed called Stockholm, appropriate since this is where our friendship took root! What a delight to sit in the sunshine and relax after such a lovely day. 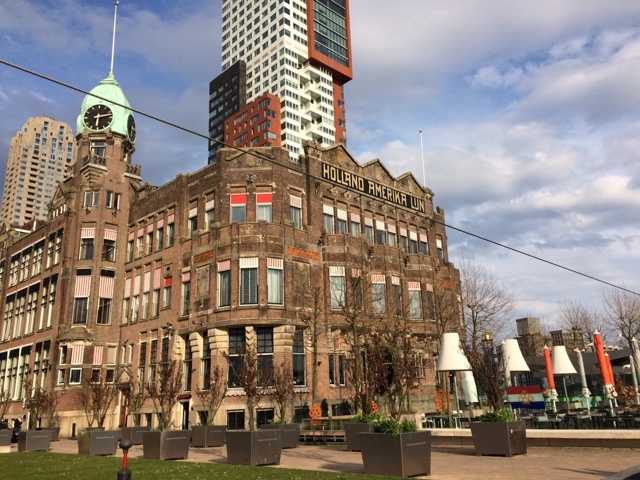 We finished our day with a meal at the Hotel New York, the place where the Holland American cruise line was first headquartered. Now it is a hotel and restaurant where people can enjoy good food and drink. The Art Deco style of the interior creates a neat atmosphere that does remind you of a day gone by. 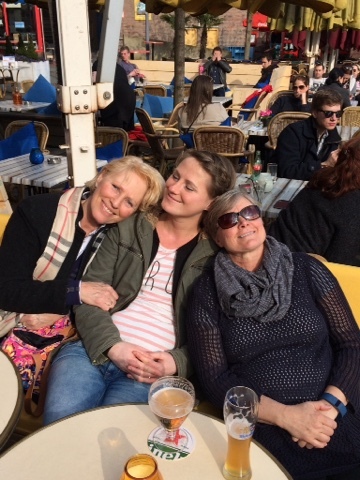 My day in Delft and Rotterdam in the company of my dear friends could not have been any better. I truly loved every step of this day.